Atlanta, GA - August 27, 2015 - Most schools in the U.S. are implementing healthy practices to help meet federal school meal standards by offering whole grains, more fruits and vegetables, and reducing sodium content, according to data published today in the Centers for Disease Control and Prevention’s (CDC) Morbidity and Mortality Weekly Report. School meal programs are an important source of nutrition as students consume almost half of their daily calories at school. CDC researchers analyzed school-level data from the School Health Policies and Practices Study (SHPPS) for 2000, 2006, and 2014 to see how well schools are implementing practices related to the nutrition standards for school meals published by the U.S. Department of Agriculture in 2012. The standards require serving more fruits, vegetables, and whole grains and gradually reducing sodium over 10 years. Previous studies have shown that students who eat school meals consume more milk, fruits, and vegetables during school meal times and have better intake of some key nutrients (such as calcium and fiber) than those who do not participate in the meal programs. “School meals are healthier now than ever before. We’ve made real progress, but there is much more to do to help American children make food choices that will keep them healthy throughout their lives,” said CDC Director Tom Frieden, M.D., M.P.H. Between 2000 and 2014, the percentage of schools implementing five of the nine school nutrition services practices examined has increased significantly. Almost all schools offered whole grains each day for breakfast (97.2 percent) and lunch (94.4 percent). Most schools offered two or more vegetables (79.4 percent, up from 61.7 percent in 2000) and two or more fruits (78.0 percent, up from 68.1 percent in 2000) each day for lunch. Nearly one-third (30.5 percent) of schools offered self-serve salad bars. More than half of schools that prepared their meals at the school used fresh or frozen vegetables instead of canned (54.1 percent), used low-sodium canned vegetables instead of regular canned vegetables (51.8 percent, up from 10.3 percent in 2000), used other seasonings instead of salt (65.1 percent up from 32.8 percent in 2000), and reduced the amount of sodium called for in recipes or used low-sodium recipes (68.0 percent up from 34.1 percent in 2000). 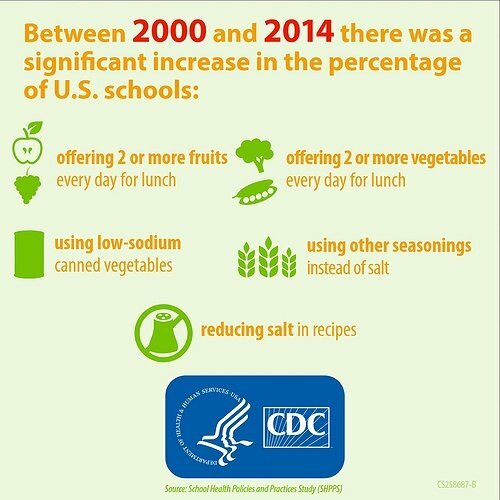 Although schools are moving in the right direction, there are many ways to further increase fruit and vegetable availability and reduce sodium in school foods. Schools can assess their nutrition policies and practices by completing CDC’s School Health Index and implement strategies found in CDC’s School Health Guidelines to Promote Healthy Eating and Physical Activity. School officials can ensure schools have appropriate equipment to prepare and serve fruits and vegetables (for example, food processors, knife sets with cutting boards, and refrigerators). Schools can participate in partnerships like Let’s Move Salad Bars to Schools. Districts and schools can work with CDC-funded staff in state health departments (State Public Health Actions) to offer ongoing training for school-nutrition professionals, and to provide resource materials to school administrators, teachers, and parents to further improve school nutrition practices and support the meal programs. U.S. schools have significantly improved school nutrition practices and should continue striving to provide a quality nutrition environment for students. For more information about CDC’s Healthy Schools activities, visit here. Subject: LongIsland.com - Your Name sent you Article details of "CDC: America’s Schools Make Positive Changes to Create Healthier School Meals"